Last Friday, I told you how I was surprised with gifts from the owner of Paris J Boutique. I showed you the shoes… and I said she also gave me an accessory. But this piece does chains with class. It looks like a gold cuff, three rows of circles thick and woven in the circles are light and dark silver chains. It’s really really cool when you see it up close. I tried to get a good picture of it, but none of them ended up doing it justice so you’ll have to trust me on this one. Luckily, the day Teresa gave me the bracelet, I was wearing a black and white dress, and had accidentally forgotten to put on any jewelry before I ran out of the house! So, this was a perfect statement piece to accessorize my outfit. And because it’s so loud, I didn’t need any other accessories, really. 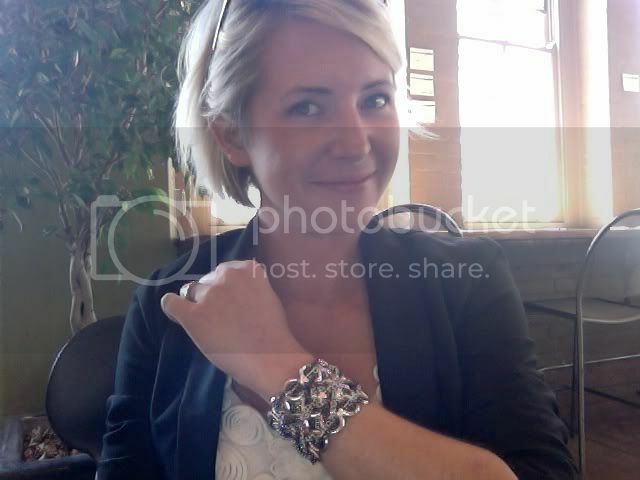 I ended up getting a compliment on the bracelet at my next meeting. She said it was “off the chain” haha! It’s funny because the bracelet has chains. Oh, dorky humor, you get me every time! Previous PostFabushoe Friday: Lovely in LaceNext PostThis Week on Cincy Chic: What’s up Doc?